About 40 Star Wars figures in their original packaging are expected to make about £5,000 when they go to auction. The vintage toys, which belong to an unnamed Leicestershire collector, includes the rare Yak Face, which is highly sought after by enthusiasts, auctioneers said. 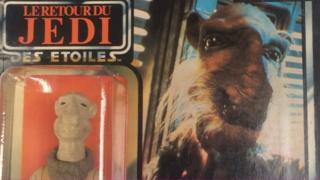 It is based on a character who appears briefly in the Return of the Jedi and has an estimate of up to £800. Hansons, based in Derbyshire, expects the sale to "spark worldwide interest". David Wilson-Turner, head of the auctioneers' toy department said "untouched" Star Wars toys in their original packaging are "unmissable". He said that 60 vintage Star Wars toys trebled their original estimate of between £2,000 and £3,000, selling for £9,240 at a previous auction in 2018. In May 2017, a Jawa figure, with a vinyl cape, fetched more than £20,000 in North Yorkshire. "What we've found from experience is that buyers come out in force when a major batch of Star Wars toys come up for auction," said Mr Wilson-Turner. Many Star Wars toys were made at Palitoy, a company based in Coalville, in Leicestershire, while others were manufactured by Kenner in the US and firms in Europe and Hong Kong. The collection will be sold at Hansons, Etwall, Derbyshire, on 20 June.